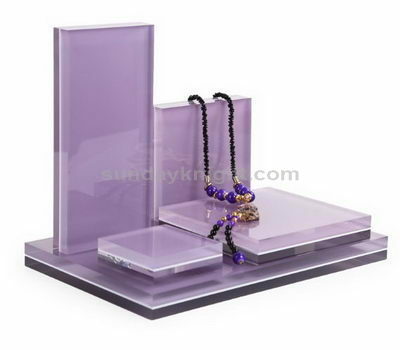 With the widespread use of acrylic, the use of acrylic display stands is also increasingly widespread. At the same time as the use, the maintenance of the display stand is usually ignored. If you want to keep the acrylic display stand in use while still maintaining a bright luster, then certain maintenance and cleaning are necessary. The display stand should be cleaned regularly. As a display prop that is exposed to the air for a long time, the acrylic display stand will inevitably have some stains and dust on the surface. The most basic thing to keep the display stand is to keep it clean. Regular cleaning can effectively maintain the gloss of the display. If you have stains that are more difficult to clean, you can choose a milder cleaner. A mild detergent is applied with clean water and wiped with a soft cloth strip to prevent damage to the surface of the display frame and to make the display stand lose its luster. After cleaning, the care agent can be appropriately selected. There are currently display rack care spray waxes and cleaning and maintenance agents on the market. Occasional use of these products to assist in maintenance helps to maintain the gloss of acrylic sheets. If you are afraid of the use of the frame for too long, the gloss will be dim. You can try to wipe the liquid polishing wax evenly on the surface with a soft cloth like a car wax to protect the acrylic from the outside. It can more effectively keep the surface of the display stand smooth, and it can keep the gloss and be as bright as ever.